An October report by UK NGO Jubilee Debt Campaign (JDC) analysed the risk from the ongoing lending boom to impoverished governments and highlighted a surge in their debt payment spending. Calling for “urgent measures” to “prevent a new debt crisis” the report notes that developing countries’ debt payments are at risk of becoming unsustainable. By analysing different economic scenarios, JDC’s report found that even in the best case, developing countries’ debt payment burdens, measured as a proportion of revenue, will increase by 85 per cent. In the case of severe economic shocks, the proportion could increase by up to 250 per cent. 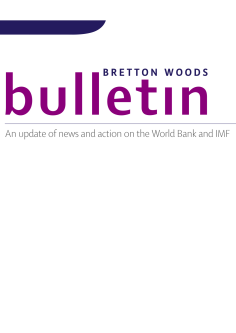 Following the United Nations General Assembly’s (UNGA) endorsement of a sovereign debt restructuring mechanism in September, which was not approved by countries including the US, UK and Australia (See Observer Autumn 2014), the IMF released a paper in October proposing contractual reforms to address collective action problems in sovereign debt restructuring (See Bretton Woods Project), for countries facing unsustainable debt burden. Patricia Miranda of Peru-based NGO network Latindadd argued that while the IMF’s reforms may prevent future “vulture fund” cases as seen in Argentinian litigations (See Observer Summer 2014), they are not sufficient to prevent similar risks for existing bonds issued by lower-middle income countries. Despite suggested reforms, Miranda said there is still a need for a “fair, transparent and independent debt mechanism,” rather than merely contractually-based approaches to address the surge in debt payments for impoverished countries.